A book comes out in market and within few hours, vanishes from the Amazon, sold out! That's the introduction of Ashish Ranjan for you. 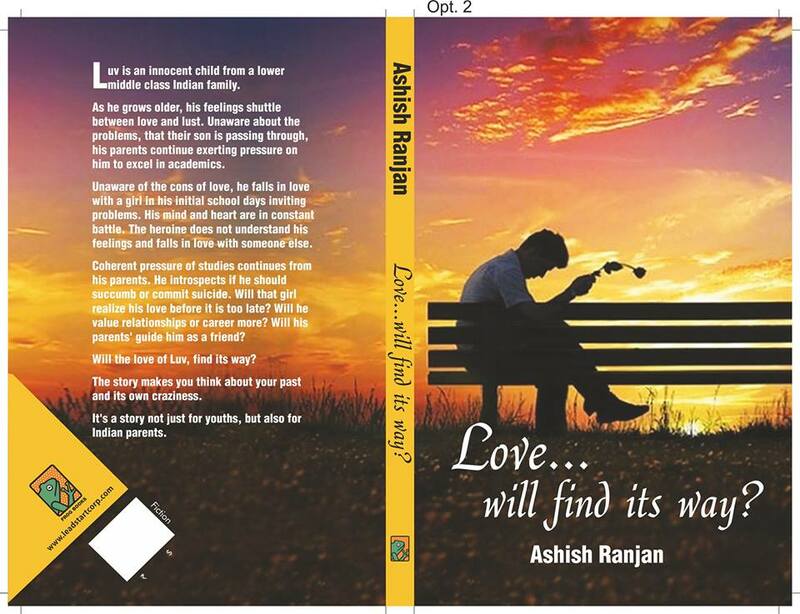 A debutant whose book, 'Love... Will find its way?' is creating miracles over online market. Let's hear him up about his journey of writing and some personal stuffs. So , let's start with introduction of yours, in your own words..
Hi. 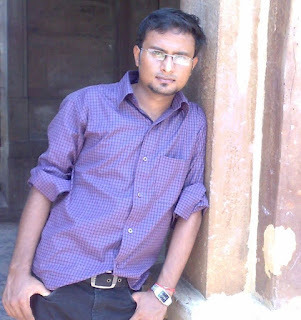 This is a simple boy hailing from a simple place, Patna. I am an engineer by profession and an author by passion. Apart from writing, I like playing cricket, travelling and listening songs. I have done my engineering from SOE, CUSAT in year 2012. The college lies in Kochi, Kerala. I have done my matriculation from DAV public school and intermediate from Ishan international public school. Both schools are in my native place, Patna only. How did writing happened to you? I started writing during my college days just to engage myself. The incomplete file was trashed in some folder, as I got imbibed into the thrills of engineering days. When I entered in profession life, I came into contact with some of my old schoolmates. We gossiped about my left-out work. Few of them persuaded me to complete the work but even then, I did not take the advices seriously. One day, I came across a headline of a newspaper about a suicide case. The lovers committed suicide because their parents did not heed to their request of inter-caste marriage. Although such news is not rare in our country but when a photo of the dead body of the couple was updated on a social networking site, I was shivered. From then I did not look back and decided firmly to complete the work for all those guys who ruin their career just for the sake of their love. I did not stop in between as I wanted to give a strong message to Indian parents also, who just want to see their ward’s name on the top of a merit list, without bothering about the root cause of their failures. I hope the novel will bring a paradigm shift in thinking process of our society. What was your parents reaction when you told your parents that you want to be a writer? Heehaw. I never told them that I want to become a writer. Actually my dad always wanted to see me as an IAS officer. I even attempted, but figured out soon that it is not my destiny. They were aware that I was writing something but were incognizant of the exact content and the theme. Nevertheless, I got full support from them. You have been working in IOCL and contrary to that you wrote a novella based on love saga. usually people of your profession write something on serious issues .. would you like to comment on this? Few stereotypes need to be changed. All government servants are not rude! Moreover, love is not confined to a specific bunch of people. Almost everyone go through love-stage, sometime in their life. The novel is just an effort to make all recall their first love; true love. 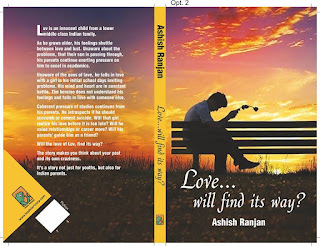 Tell us something about your debut novel “love will find its way”? The novel is about a boy, Luv who is torn apart between love, lust, friendship and career. As he grows up, his heart and mind fights and he shuttles between love and lust. He gets tangled into a vortex of love, lust, friendship and career. Pressure from parents continues for achieving good marks. He feels deserted and doubts on the greatness of Indian culture. Will he commit suicide or succumb? Will his parents guide him as a friend? Will his ‘love’ stand for him? Answers of all such questions will be unveiled in this fiction. How was your experience of working with leadstart publishers? Leadstart publishers are one of the biggest publishing houses in India. They added feather in amateur dreams of mine and were supporting enough. The protagonist somehow got inspired from your own life or a pure fiction? 30% inspiration from own life and 70% fiction! According to you what was the most difficult part of writing? Writing was fun. Difficult part was its editing. From penning down the story to writing this interview, how has your journey been so far? Neither too smooth nor too rough! Many persons left and few came, but I continued my effort for those who ruin their lives for the sake of getting their love. So, in your own life, does love finds its way or still searching? Profession life is for livelihood but if writing is your passion don’t leave it midway. At least give a shot and let’s not repent in future! It is not about name and fame but it’s all about self satisfaction. If you find the novel inspiring enough, please convey the message in your family and surroundings. You need to define your priority list, as your future is just guided accordingly. It’s tough to figure out your destiny easily but effort must go on in its search. Would you like to share some details of your future project with your readers ? I am yet to start working on my second novel but the theme is more or less clear. It will again constitute love related matters juiced up with common but unspoken problems like domestic violence, social stigma, etc. This is it. Hope you have enjoyed our session with Ashish Ranjan. Keep following the blog for more. Stay Updated.